It's finally starting to feel like FALL in New York City after being HOT and HUMID the past few days. I can't wait to FINALLY sip on a PSL and wear my favorite sweater and ankle booties. I also made a bucket list of things, I'm looking forward to doing this Autumn. 1. Since I actually have some time on my hands now, I want to make photo holiday cards for friends & family this year. 2. Stock up on Fall scented candles from Bath & Body Works. Annual tradition. 3. Plan a day trip to a winery. I came across this one, that has a tasting room in a renovated barn. And I've been wanting to make a trip to upstate New York, so this is the perfect excuse to go. 4. Host 'Friendsgiving' in the city. This will be the first year that I won't be going home to see my family, But I'm really excited to have Thanksgiving here with friends and see the parade. 5. Enjoy some of the best of things to do in New York during Autumn. Of course this includes seeing the Fall foliage in Central Park. 6. Find a new pair of snow boots for winter. So far, these are my favorite. 7. Visit the New York Botanical Gardens. They have a FRIDA KAHLO exhibit that I’m dying to see. 8. Spend a whole day baking. I love making Pumpkin bread this time of year. 9. See the Broadway Show WICKED. 10. Go to the iconic Village Halloween Parade. 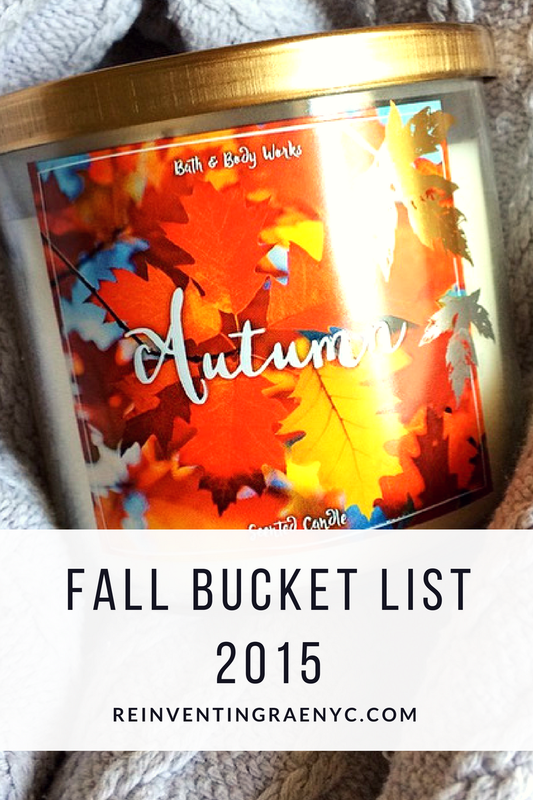 What are you planning for your Fall Bucket List?